← Who Killed the Family Business? I’ve been writing professionally my entire adult life — books, articles, reports, marketing copy, radio and television commercials, blog posts, you name it. I’ve always proudly proclaimed that I never get writer’s block. Until today! Nothing came to mind as a topic for this week’s blog post. 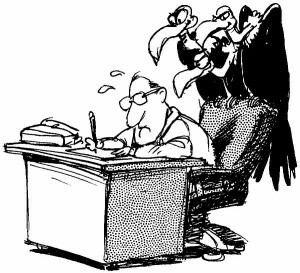 I had a terrible case of writer’s block and the vultures were circling overhead. Pressure as it was, I found my answer. Most of my ideas come from my personal experiences and from what I see and hear in the world of business and marketing. So, I thought I’d write about my dilemma du jour –– writer’s block. There are some rules I follow that make writing easier and more fluid and can help prevent writer’s block. These apply to most all writing. Little stories make for great ideas. Like me, today, writing about writer’s block. It’s not earthshaking, but it will help someone. And it’ll be fun to read. Write about what you know. This is perhaps the most important of all. You wouldn’t jump into a conversation with a group of medical technicians (unless you were one) and start pontificating. When you write about what you know, it’s effortless. Just start writing. Some people use an outline. I don’t I just start writing. I may not keep everything I write in my final draft, but that doesn’t matter. I just get it on paper. Have fun with your writing. If you’re pushing too hard, you probably won’t do a good a job. Write the way you talk. When people try to get fancy in their writing, it slows them down. Plus, most writing these days is casual. Write to a specific person. You’re not addressing all prospects, just one. So, write to that prospect avatar. Write the first sentence last. When I edit the work of others, I often chop the first sentence and sometimes the first paragraph. I think that comes from people trying to tell the entire story in the first sentence or trying to say too much. Let it sit overnight. When you come back the next day, you’ll always find opportunities for making it better. I don’t know if this blog post will go down in the annals of history as my greatest post of all time. But it served a purpose. No more writer’s block and my weekly post is done! This entry was posted in Marketing Writing and tagged copywriting, Marketing writing. Bookmark the permalink. This blog helps too with a sibling of writer’s block: procrastination. Last night I worked til 3 am on something that had been weighing on me. Got it done (yay!) but bullets 2-6 would have helped me win that battle earlier. Will go apply them to the next item on my too-long-on-my-to-do’s list. Thanks, Gil.